Well, I made it back safely. I survived three weeks of "authentic" Asian food, begging children, cold showers and Philippine Airlines. My camera made it through. It still works after being subjected to 100% humidity, monsoon downpours and the occasional knock. Thank you Panasonic. The Lumix DMC-FZ28 is one hell of a sturdy camera. Dusty is still alive. He stayed with a friend and has been vomiting more than usual but still seems to be doing quite well. He will be 16 years old in January. I'm taking him to the clinic on Monday for more bloodwork and a full checkup. And now it's time to organize the apartment and get ready for work. I start back at it on Monday. 4 and 1/2 months off. My freedom is coming to an end but I can't talk about that right now. I'm still in the glow. I want to back up. I had such a great time in Asia, I want to share some of the stories. And a LOT of the photos. The final tally for the number of pictures I took is 2750. I will be editing them for the next ten years. How about I go back about two months ago when I first decided that I wanted to go to Asia? My brother offered to give me some of his airmiles to help with the expense so it became an opportunity that I couldn't pass up. I still had some time left on my sabbatical so the timing was also perfect. I wanted to go for three weeks. The first obstacle were the visas for Cambodia and Vietnam. Cambodia wants you to have at least six months remaining on your passport in order to get a visa. Unfortunately my passport was expiring in three months so I had to put a rush order in for a passport. I was still in Canada at the time so I had to scramble to get all the documents together before I left Canada. I was able to get an urgent Canadian passport in 24 hours and along with the necessary urgent birth certificate, I was already $200 out of pocket. Thankfully, Cambodia has an evisa which means that you can apply for the visa online. Vietnam, on the other hand, wants you to send in your passport to the embassy so they can put the visa right in your passport. I sent in my passport and received it a week later. Unfortunately they only gave me a single visit visa (and I needed a multiple visit one) so I had to send the passport back. Time was clicking away but I was able to get the correct visa about a week before I left. The cost of the Vietnam visa was $130. This is criminal. Essentially, this is just a way of ripping off the tourists who are going there to spend money there anyway. Maybe this is just another way the Vietnamese are trying to screw the Western world for all that Agent Orange. 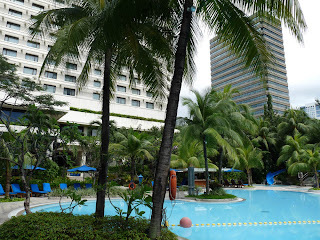 Anyway, I really wanted to go to Saigon so I didn't complain too much about the additional cost. I figured would be saving money on the food and the accomodation. My next obstacle was Philippine Airlines, affectionately known at PAL. At the time of my departure, I was thinking that they were no pals of mine. I ended up paying over $400 for a ticket that I thought was going to be more or less free for the number of airmiles that I was using. They told me that there was a "fuel surcharge" and "additional taxes". Just to redeem the airmiles was a chore and a half. They wanted all my brother's information, my information and enough paperwork to make a 20 page fax. The day of my departure they told me that my flight was cancelled and I would be leaving the next day. The reason was mechanical. The last thing I wanted was to leave on a defective plane but at this point, I was wondering if I was ever going to make it to Asia and this delay was one more sign that the trip wasn't going to happen. But it did. I boarded a very tired old Boeing 747. The seat in front of me was held together with duct tape. There was a piece of another seat that I kicked around for the entire duration of the flight. The televisions were filled with cranky static and worst of all, the first movie of the evening was Indiana Jones part 4. Thankfully they supplied us with heavy duty barf bags. The only good thing about the flight was my flight attendent. She was a beautiful Asian woman named Cherry Pie. She had a great smile and served me up some pretty good food. I fell asleep for most of the trip; the whole thing was about 12 hours. My first stop was Manila in the Philippines. I arrived at night and was picked up at the airport by a very officious looking man who had a sign with the name of the hotel on it. 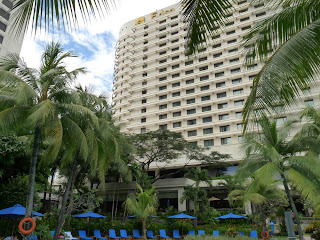 I was staying at the Edsa Shangri-La, which is a five star business luxury hotel. My brother recommended it to me, thinking that I had WAY more money than what I do. This is my first picture I took of Asia. It is the view from my room at sunrise. I slept well that night but got up around 4 am. The Shangri-La is a gorgeous hotel and the staff practically trip over themselves trying to help you out. I liked the elevator guy. Every time I walked nearby he pushed the elevator button. Sometimes I didn't get on the elevtator because I was going somewhere else and it made me feel bad for him. I felt like I had disappointed him in a small way. The pool, as expected was great. A couple of old men in speedos were swimming in it but it didn't deter me. I was on vacation and damnit, I had a right to that pool too. Patrick (my travelling buddy who arrived at the hotel later) didn't stay very long. Manila was just a quick stop over. We were travelling to Vietnam on another airlines called Cebu Pacific Airlines the next day. Cebu Pacific is kinda like the Southwest airlines of the Philippines. No frills and the flight attendents dress like they're cheerleaders. We tried to book the flight online with American credit cards but the website wouldn't accept them. Apparently, Cebu doesn't accept yankee plastic. I had to use my dad's Canadian card. Hmmmm. Cebu Pacific, don't ya like the Americans??? We jumped on the plane at 11 o'clock at night. We were headed to Saigon which can be loosely translated as city of complete chaos.